Maggiorani glues a poster of Hollywood starlet Rita Hayworth on a wall in an ironic juxtaposition. After the crippling blow to Italy’s economy, national pride, and societal infrastructure by the rise and fall of Fascism and the Second World War, the Mediterranean country was left scrambling to recover itself after the devastating conflict left much of the planet a ravaged war zone. Italy in particular was hit hard economically, and many of its citizens were left in dire poverty as the nation’s social infrastructure buckled. During this time in the late 1940’s, Italian filmmakers became increasingly aware of the plights of the working poor, and turned their creative attention to the lives of those left scrambling to pick up the pieces from a broken, war-torn Italy. The most famous European cinematic trend during this post-war period, which laid the groundwork for Marxist-inspired 3rd Cinema movements from Africa to Latin America, and paved the way for the highly influential French New Wave of the ’60’s and ’70’s, was Italian Neorealism. 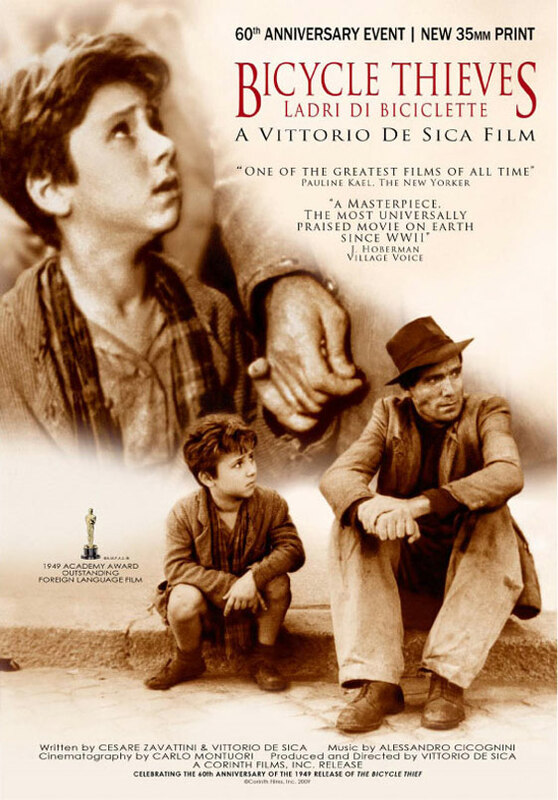 Italian Neorealism (INR), of which there is no more famous example than writer-director Vittorio De Sica’s Bicycle Thieves (or The Bicycle Thief), was the antithesis of the then current studio productions of Hollywood. Neorealism would become famous for its use of outdoor sets, location-shooting, natural lighting, non-professional actors, and a narrative emphasis on the working poor. The movement that The Bicycle Thief epitomized was about the average, run-down little man and his fight for survival in an uncaring, often ambivalent world where bad things happened to good people for no apparent reason at all. The premise for Bicycle Thieves concerns a father (Lamberto Maggiorani) of a poor family whose bike is stolen and is unable to work his job, so he searches for it with his son (Enzo Staolia) on the streets of Rome. Their quest is like searching for a needle in a haystack — in a city of millions, where thousands of bicycles ride the streets or are parked along sidewalks, many of which are frequently stolen, broken down, and sold for spare parts. Maggoriani (left) and his character’s son (Enzo Staiola, right) prepare to go out for a day of work in the happier, earlier sections of the film. This is Bicycle Thieves and the INR movement in a nutshell. Its pseudo full-circle ending, where Maggiorani tries and fails to steel a bicycle out of desperation, further highlights the cruel irony and pessimism of the cycle of poverty of these characters’ lives; on the other hand, the primary message of the movie is that there aren’t any easy answers for the downtrodden. The fact that De Sica doesn’t beat around the bush with making his point is refreshing for a European auteur of that time, as well as compared to the French New Wave filmmakers that would follow. There are traces of disdain for the gross inequity of wealth in Italy at the time, and indeed in most places all the time, but the film stops far short of the exhausting cynicism later Marxist pictures of the 3rd Cinema movement would hammer into the ground. It’s a humble, depressing drama that never becomes exploitative in its of images of poverty, nor does it ignore the harsh realities its characters face. SUMMARY & RECOMMENDATION: Vittorio De Sica’s groundbreaking location-photography and realistic cinematographic style influenced filmmakers from Ousmane Sembene to Satyajit Ray to countless others for a reason. He uses his socially conscious camerawork and a powerful story to paint a picture of a forgotten people just trying to survive. Bicycle Thieves’ reliable non-professional cast works well with the material and with each other.
? Screw this, let’s a get a pizza! Thanks. So full of humanity, charm and pathos. Regards Thom.